Due to a busy schedule at work, I’m unable to run for three consecutive days. Major – major! – running withdrawal is happening already. Seriously, the best part of my morning was nearly missing my train – those six seconds of running felt glorious. Worse yet, I’ve got three days are packed with eating out: a birthday dinner, a company dinner and wine tasting. Yikes! Skipping a run — or two months’ worth — is easily justified during the holidays. It’s travel time! Family time! I’m too tired from decorating the house! But I went shopping, doesn’t that count for cardio? Then comes January and holiday hangover settles, along with a few extra pesky pounds. It takes a lot more effort to drop those pounds than it did to gain them! The good news is, staying active during the holiday season isn’t that hard. Especially so if you enlist friends, family and technology to keep you motivated. With the help of friends, social networks and a few smartphone apps, I not only maintain my mileage but even increase it a little — so I can enjoy all my favorite holiday treats guilt-free. Here are five things to consider. You may say that’s easier said than done, but I mean the “set a goal” part quite literally. For the past two and a half years, I have been tracking all my runs with RunKeeper: an iPhone and Android app that maps your runs and, using your phone’s GPS, provides detailed information on your speed/ pace, distance covered and calories burned. One of its coolest features, however, is the ability to set goals and track their progress. The goals can be for cumulative distance (I will run 50 miles in a month), finishing a race, achieving a distance, or even losing weight. Let’s say you’ve decided to run at least three days a week in November and December. Tell your friends and coworkers about it. Post it on your Facebook wall, tweet about it regularly, blog. The more public your goals, the more motivated you’ll be to meet them. 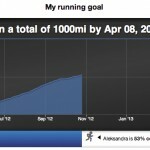 I have yet to skip a run since I started writing my own blog, AleksRuns.com. For even more encouragement – from strangers, no less – I have signed up and use Fitocracy: a mobile phone app that gives you points for tracking your workouts. All kinds of activities qualify, from weightlifting at the gym to swimming, biking or running. It has a social aspect too: you can follow other users, give them virtual props for activities or achievements, and receive props yourself. Ask questions on the social feed or simply collect badges: virtual awards for reaching milestones like running 50 or 200 miles, biking and running in the same day, and so on. If virtual hugs and likes aren’t motivating enough for you, you can take things to the next level, where real money is involved. 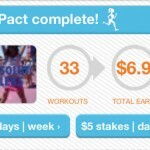 For about a month now, I’ve been using an app called GymPact (currently available only for iPhones). It works like this: I commit to a certain number of days each week during which I will work out at the gym or track an activity with RunKeeper for at least 30 minutes and 2 miles. Then I bet a certain amount ($5 is the minimum) and agree to be charged that sum for each day that I miss in a given week. If I commit to five days and only work out three: that’s $10 charged to my credit card. But if I do meet my pact, I get real money! The more days committed, the higher that amount will be. What the folks at GymPact do is collect everyone’s missed-workout dollars and split them up among users who’ve met their pact. 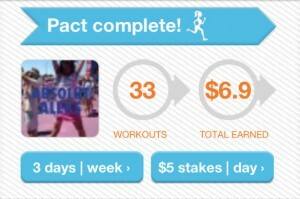 I’ve committed three days at $5 per missed day and generally earn about $2 or so per week. Running a 5K or 10K race is a great way to start off Thanksgiving and the holiday season. Personally, I join about 20,000 other people to run the Silicon Valley Turkey Trot in downtown San Jose, but there are at least five other races taking place in different parts of the Bay area (a search on Active.com should reveal them all). One Bay Area race organizer – Brazen Racing – throws not one, but two Thanksgiving runs: the Nitro Turkey Thanksgiving run (10K or 5K) on Thursday and the Quarry Turkey Half Marathon, 10K or 5K on Saturday. The best part: both races have kids’ fun runs, which are free to the children of registered participants! 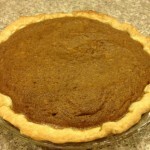 Oh, and the other best part: run on both days and enjoy your favorite pie guilt-free! Also, you get this special double-challenge medal. While you’re at it, check out some other races near you (or your favorite travel destinations) and start filling up that 2013 race calendar. Not only will you save money by signing up early, but you’ll have real motivation to keep running — even if that sofa by the fireplace seems most inviting.